From The Collins Press, An Irish Butcher Shop is a food lover’s companion you will treasure. 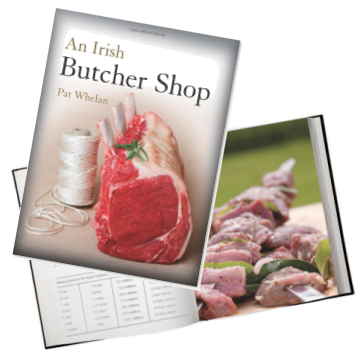 Written by Pat Whelan, fourth generation purveyor at James Whelan Butchers, it includes 90 recipes covering beef, poultry, pork, lamb and game in spectacular style. Good meat is one of life’s sublime pleasures. Pat Whelan has a passion for everything about it, so it’s no surprise Rick Stein lists him as one of his Food Heroes. From the quickest pan-fried steak to a slow-cooked dish, Pat understands how to get the best taste experience from cooking. It includes 90 of Pat’s favourite tried and tested recipes; dishes that sum up his warm, family-oriented and eclectic outlook on life. Evocative recipe shots and outstanding recipes for today’s kitchen capture the quality of the produce of James Whelan Butchers. Hardcover. 259 pages, 90 recipes, 114 full color photographs. Available at James Whelan Butchers, at fine booksellers nationwide, and online at Amazon.co.uk.